We are excited to report that the new Halloween-set horror film Fright Fest has been renamed American Fright Fest upon being acquired by Gravitas Ventures and released on VOD, available now on Amazon Prime. The official synopsis: Blood runs rampant on Halloween Night when a small towns’ Fright Fest turns real, as a politically ambitious Mayor (Kresh Novakovic) from a small town – Sommerton – decides to mount a live Fright Fest in a long abandoned state asylum. He recruits a downward spiraling cult horror film director in Spencer Crowe (Dylan Walsh), a man no longer capable of delivering the caliber of Horror classics he once created with ease. Mayor Fowler expects Crowe to put on a spectacle no one will soon forget, only problem is a van of criminally insane prisoners crashes just outside the perimeter and the trick or treaters think their murderous acts are part of the show. Is the price of admission worth dying for? – not if you can make it out alive. “The film delves into the dividing line between make believe and reality with an ironic twist at it’s core,” Novakovic previously told Halloween Daily News. “It’s the trope of a slasher film set in a Fright Fest on Halloween night, basically a slasher’s dream come true. Audiences can expect the unexpected as the line between reality and imaginary blur and blood flows continuously.” See what else the director told us here, and look for our full interview soon. American Fright Fest premieres in the UK on Saturday, August 25th at the London Fright Fest Film Festival. Signature Entertainment and Fright Fest Films Presents have release dates scheduled for October in Cinemas and VOD platforms in the UK. 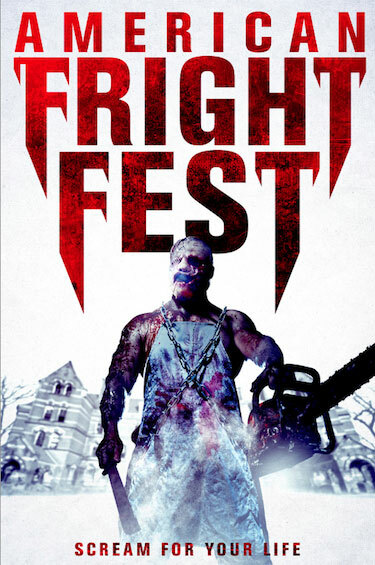 The film stars Dylan Walsh (The Stepfather) as a legendary horror director in charge of the town’s first Fright Fest, along with Madison McKinley, Kresh Novakovic, Mercy Malick, Romeo Miller, Ashley Blankenship, Jonathan Camp, and Pancho Moler (31, Candy Corn), written by Robert Gillings and directed by Ante Novakovic. The film is available here to watch now on Amazon Prime. You can watch the official trailer for American Fright Fest and view the new poster and more exclusive new photos below, and look for much more with Novakovic in our full interview, coming soon to Halloween Daily News.